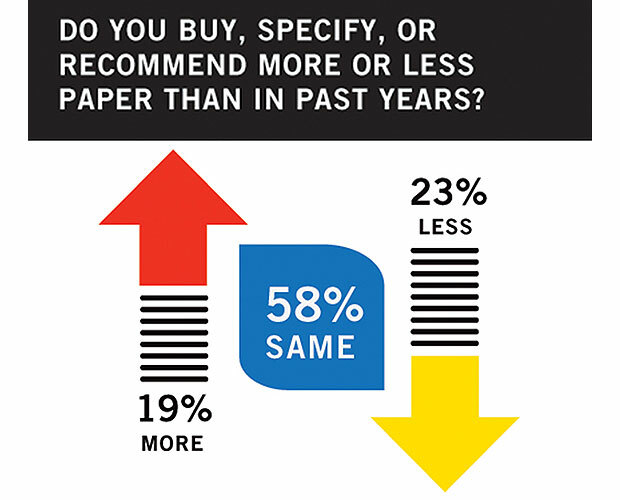 For the 52nd year, GDUSA has conducted a reader survey about print design. When print was the dominant medium for graphic designers, our surveys split hairs: lots of detailed questions and analysis of projects, presses, papers, specification practices. 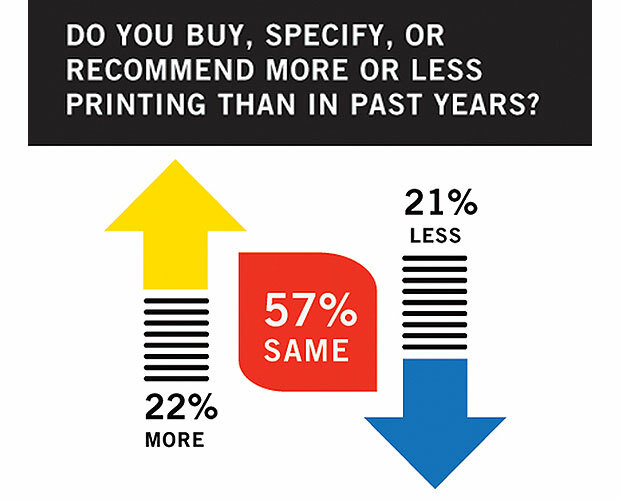 In 2015, print is far from the only game in town and this survey focuses on the fundamentals — the present and future role of print in graphic and media communications. Here, the 2015 results and comments are both suggestive and informative. 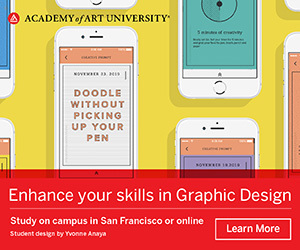 First, print remains crucial as to how professional graphic designers make a living. 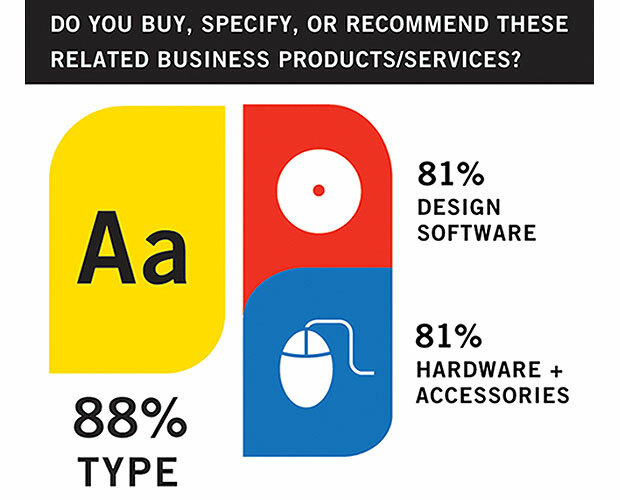 More than 9-in-10 designers work in print as part of their mix and roughly 3-in-4 projects involve a print component. 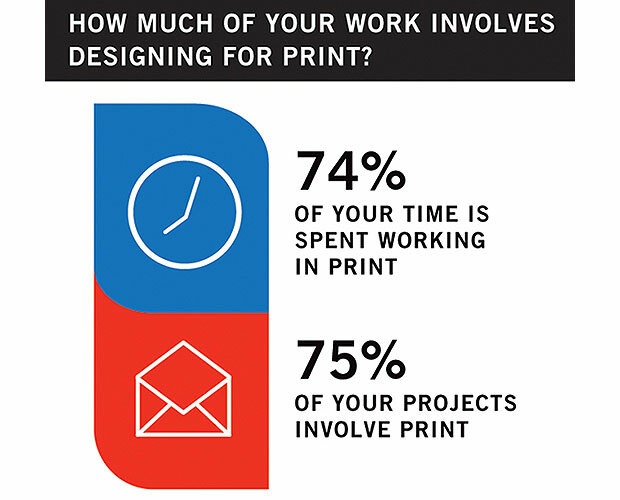 Second, designers retain responsibility and control for large swaths of the print process, with more than 8-in-10 involved in print buying and paper specification. Third, designers see the move away from print and the embrace of all things digital as having moved too far and too fast. Everyone appreciates the cost and reach advantages of digital communications but believe that print belongs in the mix. Fifth, these classic strengths are amplified by context. In the digital clutter of 2015, print can be special — fresh, surprising, novel, welcome, personal, revealing, even a statement that a brand values itself and its customers. Sixth, print’s emerging “special” role comes with responsibility: superior print design, well-crafted production, and strategic deployment matter as much, perhaps more, than ever. Finally, print’s evolution to a smarter and leaner profile — think digital printing and sustainable paper making — are helping keep the medium a relevant option when hard choices are being made about effectiveness, economics, and ethics. 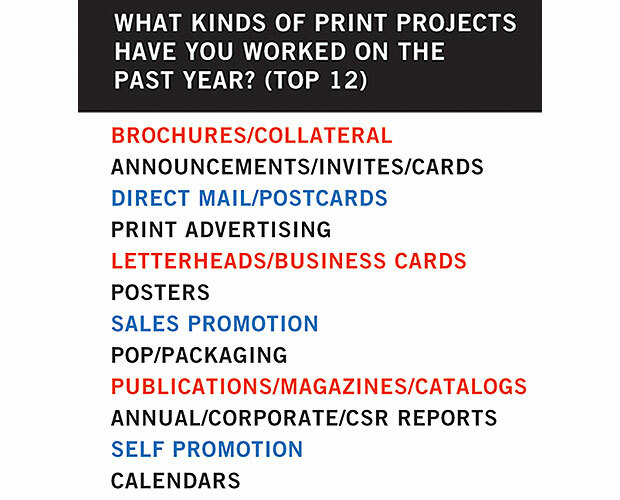 Our 2015 survey was sent to a random selection of 20,000 GDUSA print magazine and e-subscribers, and generated 2,359 responses. The benchmark results convey a clear message: though print is no longer the superstar, it remains essential to the design profession. Specifically, 96% of GDUSA readers work in print as part of their mix and spend 74% of their time doing so. 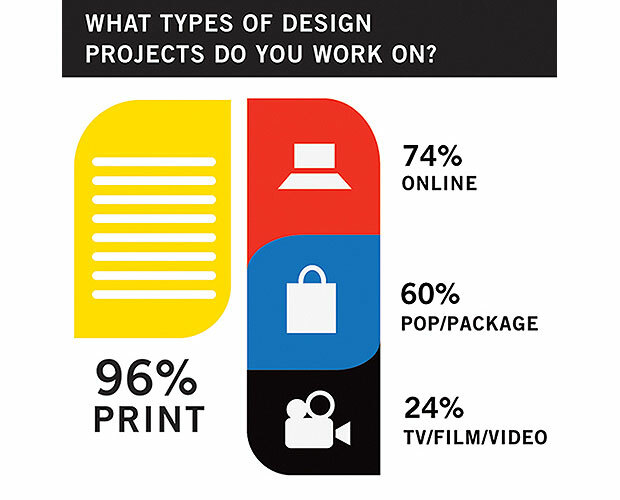 Control over key elements of the process still resides with the designer: 84% buy or specify paper, 85% buy or specify printing, 88% buy or specify type. 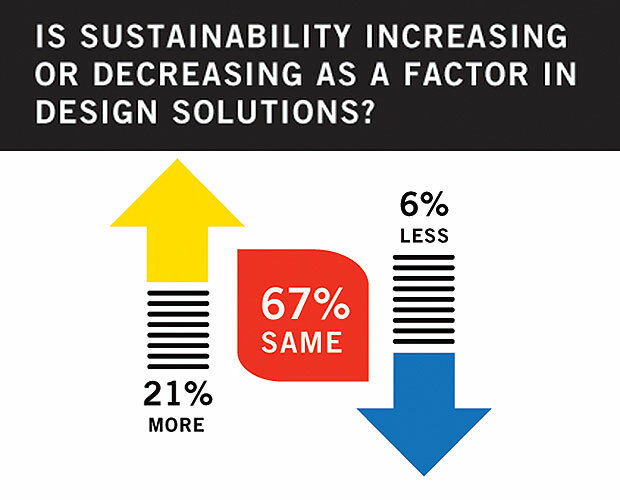 Other notable findings: brochures and collateral, followed by announcements and invitations, are the most frequent print projects; package design is seen as a growth opportunity since it’s role is less directly impacted by the internet than other print-related activities; digital printing and digital papers have become commonplace and mainstream; sustainability continues to influence design solutions and purchasing decisions; and designers maintain significant purchasing influence with regard to hardware and software. SCROLL THROUGH THE GALLERY TO SEE THE RESULTS OF THE 2015 SURVEY. 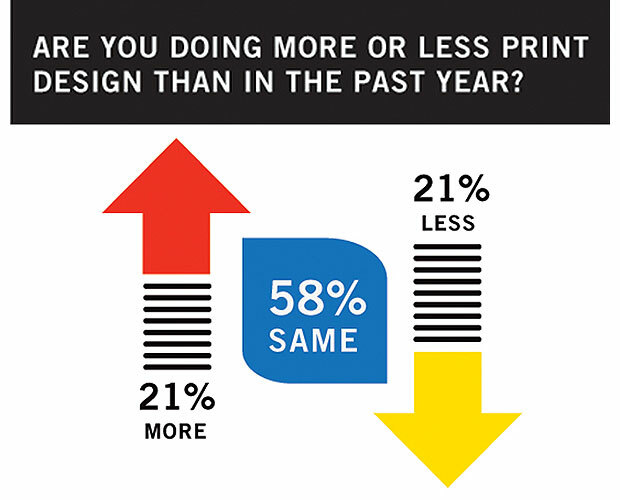 Designers feel strongly and positively about print. They value print for its classic strengths and how these can be effectively leveraged to convey a message or a feeling. Foremost is touch, but other practical attributes continue to matter: permanence, portability, convenience, accessibility. 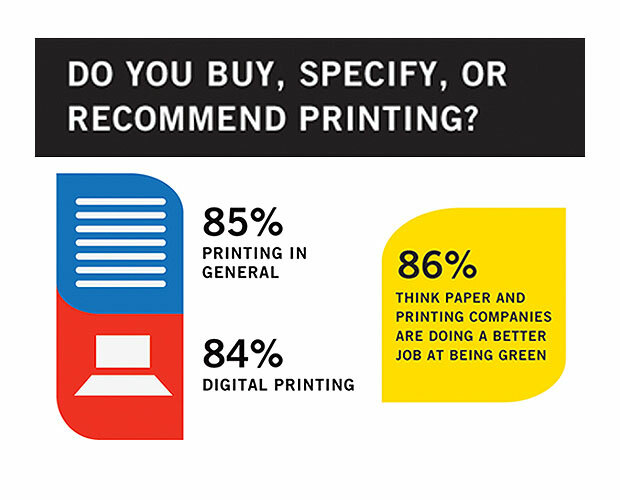 Print works, in the view of respondents, because it creates a human connection and a trustworthiness missing from the ephemeral, desensitizing, often anonymous world of digital communications. In addition, many observe that the relative rarity of printed communications makes the impact felt even more, assuming that the project is done well. Print has greater impact since those who choose to use print tend to do so for more important initiatives. 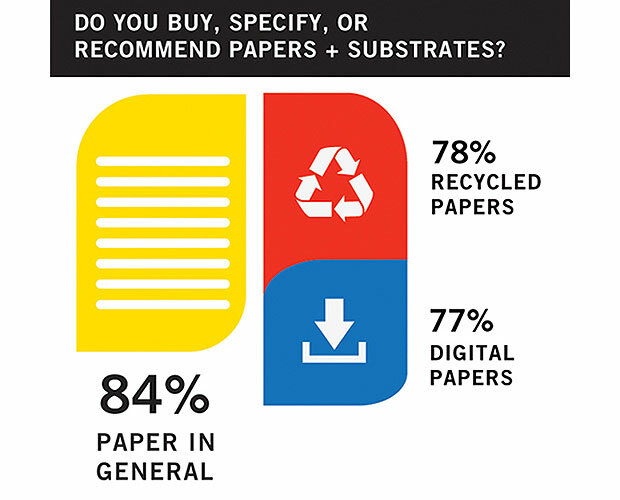 Digital is the throw away whereas print becomes more of a validator or keepsake. People are people, they want something tangible. So yes, print is still important and meaningful. 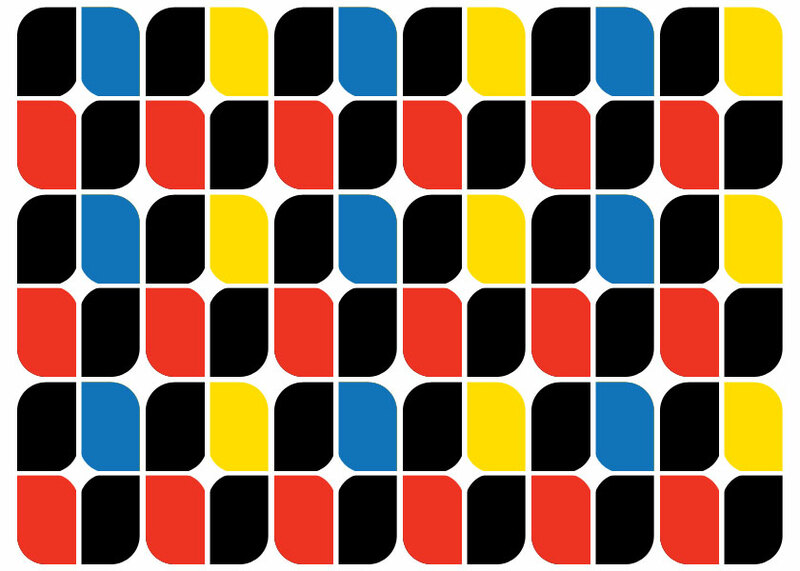 Print has the same impact, it is the designers’ challenge to keep it interesting. The digital era came upon us just a little too fast and people want to embrace print before it is completely eliminated. Digital publishing and advertising is great for immediate impact but print has longevity that digital does not. While I do understand many of the advantages of the digital age and technology, it has not held me hostage nor acquired a stranglehold on my technique or mindset. In fact, I have pushed clients (and myself) increasingly to a print renaissance. There is nothing that can compare to the tactile, visual or visceral experience of actually holding something in your hands. I detest the bent neck, eye strained, and digital dominated path that personal devices have led us down. Print is not dead and never will be. The consumer is inundated with email and web marketing, print is a medium that allows for greater impact. If an open rate could be tracked for print, it would be far greater (with great design) than an email that some do not even see. I’m thrilled to see the innovation that is happening in the print world in materials and execution because it has to compete with online media. The revival of letterpress, handlettering, varnishes and other techniques is especially fun and a reaction to the de-personalized feel of online media. Paper choice communicates the message of your design as much as graphics and copy do. Nothing ruins a great design faster than cheap crappy paper. In a world of digital bombardment, print is now a way to differentiate. 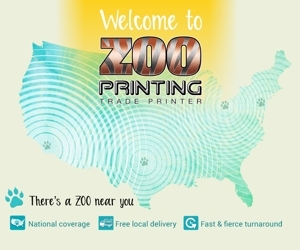 In 2014, we printed and mailed over 2 million pieces, so print is not dead! 2015 will have about the same amount and the projection for 2016 is an increase in printing and mailing with a market expansion in the works. Print will always have a place. I still love to look through a design book or a magazine with the tangible piece in my hand rather than on my computer or iPad. Any day! Print is still very important in graphic communication. Touch and permanence still matter. In an age where everything is so accessible, people feel disconnected from life when there is nothing physical to hold and feel. The digital world provides so much but when reading, touching or using print materials, your other senses click in and help with memory and recognition so much more than when seeing something on an electronic device. With quality printing becoming a luxury, I find myself noticing quality production far more than in years past. I appreciate the time, effort, and production of designed pieces that are carefully crafted. In a world of total immersion, the finer details of delivery can really separate good design from great design. The value of print’s unique qualities depends on the application. Sales and marketing materials that I design are sometimes just as effective as digital files. Costs and version control can be managed better on line than with printed collateral. I still believe in the power of print. It has permanence that digital communications will never have. Therefore, it requires more thought and intention. When it’s done well, it does have more impact because there is so much less of it. Print is still an important factor in my professional and personal life. Touch, permanence and convenience is still meaningful. Print has more impact today because people are tired of digital everything. There is something tactile about the printed piece. The traditional strengths, touch and permanence, are more important now than ever before because these qualities are diminishing in the digital no touch no personal contact world. Print has tremendous value which cannot be duplicated in a digital format. The feel and comfort associated with print is unmatched. But print remains impactful only when it is supported with superior design and relevant content. Otherwise, it becomes part of a landfill. Brands that are strong have the opportunity to drive everything. Customer experience continues to sustain brands at all levels and print continues to contribute. Throughout shopping cycles, consumers are connected to brands at many touch points including packaging, POP and direct marketing. The critical factor is, and will continue to be, the quality of the communication and its impact on customer relationships. Print is still an important factor in my professional and personal life. Touch, permanence and convenience is still meaningful. Print has more impact today because people of tired of digital everything. Printing on paper is always important and will be. Web-only ads and designers are quickly forgotten by consumers. Print was holding its own alongside digital until budgets were slashed starting in 2009. Digital work is huge due to the results and cost savings it offers clients. I am part of a generation that has had to adapt from a print- driven world to a technology-driven one. The digital revolution has brought blessings as well as curses. In spite of the change, none of us can escape the fact that human beings are tactile creatures. We like to touch and feel things. We like texture and the weight of things in our hands. These things we can touch carry a special meaning, vastly different from the one we get from the electronic glow on a screen. Print is still relevant in 2015. The amount of print being smaller now needs to have a more impactful message. Paper is very important to me personally because I love the tactile dimension of paper and writing things down is a very important part of how I document. Sometimes people want to touch and feel something in front of them rather than examining a digital screen. Print will always have a prominent place in graphic communications. Although our world is slowly progressing to a digital lifestyle, there will always be things like POS, POP, posters, invitations, etc. that are well designed and have tactile qualities. Print will always be around for businesses that require it for their category. Packaging, p-o-p, shipping and the like. Print that existed 10 years ago for all visual communications will never come back because of the advent of web-based media. That’s pretty much dead. With the advancement of digital printing technologies, print has reestablished its role in the marketing lifecycle. It is nice to unplug and hold something in your hand that has texture. Yes, print is important and, yes, it has more impact because there is less of it. But until the cost of printing/mailing can compete with the minimal cost of digital/web, printing will continue to lose ground. Print can have an important place if it is used strategically. For example: my business card has information as usual on the front. On the back, however, it says three short things about me. I get many comments about it which, in turn, leads to good conversations. Print is still relevant and has become more noticeable when done correctly. In consumer packaged goods marketing, we use print every bit as much as ever. Our online presence addresses different audiences and supplements our print marketing. Print design will always give the personal feeling to advertising and design. You can touch it, smell it, feel it! Print will always have a place at the table. Nothing beats the tactile feel of a print piece, and you don’t have to worry about whether or not you’ll have a connection, colors and experience will be on brand across platforms. As inhouse creatives, we receive requests for brochures, flyers, posters, cards, educational material, maps, and more. These solutions help inform the public and bring value to their experience. We’ve added interactive digital sign boards and kiosks to the public’s experience. The main focus should always be accomplishing the objective, not just creating nice looking pieces. The traditional strengths of print are more relevant in today’s world than ever before. People are starting to learn that digital isn’t always better. Print is starting to make a come back for impact projects but, in general, clients are utilizing their print budgets for other digital things. For some clients, PDFs and sales presentations are the new print materials. Print is still important! My clients like to have something tangible to show off or proudly display. Because there is less of it, the quality of printed pieces need to be superior. Print is still relevant and necessary in a B2B setting. While we frequently employ email blasts, electronic ads, and motion creative, we frequently receive more feedback on our printed materials. These pieces matter to our customer and so we put more effort into selecting the right elements for them, including paper and finish. Print still introduces the human element to advertising and allows for more interaction. Our world is still full of individuals who aren’t necessarily comfortable with dedication to the digital market and so it is important not to cut that audience out. Advertising must be versatile offering visibility on many sources and platforms. Although the increasing demand for digital can’t be ignored, print still holds a part in the game of design. I would rather get a well-designed print piece than receive a PDF file. I enjoy the feel of paper, the smell of the inks, the tactile qualities of different varnishes. In my personal life, print is quickly fading away. The company is going digital, which is saving us boat loads of money. To further explore print’s appropriate and changing role in the mix of media communications, we noted that many non-traditional brands — Uber, Airbnb, WebMD, CNET — are introducing print into their marketing mix for the first time — and many traditional brands — IKEA, JC Penney, Newsweek, Conde Nast — are doubling down on print. We quoted Kim Caviness of McMurray/TMG, the agency behind WebMD magazine, who said: “Nothing communicates premium and ‘we value you’ like print. Basically you’re taking a powerful digital experience and then personalizing it and taking it to that next level of engagement.” We asked readers to react to the notion that, in the digital clutter, print is a fresh way to engage the customer and elevate the brand. Many hope it is a trend and some see it simply as a blip. I think people like tangible items. I also think millennials, like myself, are still a little nostalgic towards print. That being said, it sort of puts print in that retro realm now, like vinyl records or throwback jerseys. Many people see the world as depending on technology, and think that they can just focus on the digital aspect, but then realized it didn’t work very well, and are now backtracking. With digital communications so the norm and so fleeting, print shows a level of commitment to the consumer, stakeholder and employee. It says you’re important and we’ve taken time to craft this piece for you. The tactile engagement that print provides will always be important to brands who seek to position themselves within a market. The opportunity to convey a brand’s personality will always be a key factor to engagement. A printed piece can be the “next level of engagement.” With digital communication there is an sense of mass communication in an inexpensive and throw-away wrapper. Print might say, “We value you enough to spend the extra dollars putting this in your hands.” This is especially effective if it is well designed, creative and of obvious quality. Print is like a “gift” — something for the consumer to have, hold and own. It has dimensionality that online communication does not have; the feel of the paper, turning pages to reveal a vision, colors, and details that screen resolution cannot capture. Catalogs and other publications have become artful and beautiful pieces to display, allowing a company’s message to live on. Yes, there seems to be a growing trend back to print pieces to support online marketing. In spite of being a print designer, I have to admit that I receive a lot of print pieces in my mailbox that I would be happy NOT to get. The print piece needs to be of value to the person receiving it, not just to the company that sent it. The industry is much like a boat in the water, drifting through phases of turbulence and calm. With such a downward movement of print in favor of the digital world, it is only a matter of time before the industry responds and embraces what was once tossed out, literally. Print will make a return, but maybe the waves will not be as high this time. The idea of print being dead was short-sighted at best. Online advertising is ubiquitous, often ugly and increasingly intrusive and noisy. People tune it out, resent it and often feel the need to go offline in order to reduce the stress in their lives. Print now looks less aggressive. Done well, it can seem more posh, personable and respectful of the user’s boundaries. I dearly hope it is not simply a trend, but a return to the atelier-inspired, highest level of craftsmanship. I’ve heard that the largest user of direct mail is Google. I like to think that print validates or reveals your brand. Digital communications are easily ignored, forgotten, or misplaced. Really great design in a print piece can make a statement of high value and quality related to both the company sending it and the person receiving it. We hypothesized that package design presents a growth opportunity for designers and printers because it is an area less directly effected by online communications than many other activities, and because it is well-positioned to help advance the brand and make the sale in a fragmented media marketplace. Readers responded as follows. Package design is very important and will continue to play a large part in design — it is what you confront every time you purchase or use a product. Packaging is one area of print in which clients are still willing to make a substantial investment which gives us more freedom to explore and experiment. Packaging is important and has been maintained in the design world … while standard print has become less valued and minimized. Harder to break into, but a field of design that is truer to the mission and values of the graphic design world. I’m glad package design is one of my niches, and that many designers have never stepped into the arena. That’s fine, keeps me relevant and not redundant. People will always and forever reach for a box, bottle, pouch, what have you, when they buy something in the stores. Even if purchased online, the package still has to be made. You can’t really replace package design digitally, and it’s becoming more important because there are so many products that now there’s a greater effort to ensure yours stands out. Packaging is, and will be, a place where consumers can be influenced at the critical point of sale. Packaging that efficiently communicates a brand image can have success regardless of its marketing spend. In many instances a brand’s value is dictated by its packaging. Many other factors are squeezing package design — shelf space, packing requirements, etc. I don’t think that has changed. Package design has crept into the personal space in ways that were not part of the status quo. I’ve designed some unusual invitations or announcement pieces that are more “packaging/package design” than a simple invitation counterpart. I think the words “bespoke”, “one-off” or “custom” certainly apply. Apple, among others, has raised the bar on packaging. There is increased awareness, among the general population, that packaging speaks a language unlike any other print or digital component of a product. 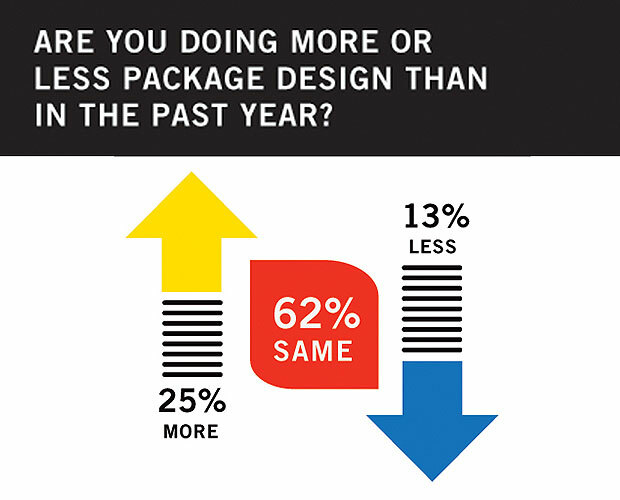 Packaging has been less impacted than other areas of print. Consider the growing amount of independent regional manufactures that require competitive packaging. It’s not just the big corporations on the shelves in my local market. Online lacks touch and smell. So if I were a company today and my products required packaging, I’d take a big step back and think like a start up. Begin with a mission statement and rebuild from there. Make my packaging want to be picked up and explored. Take funding from lesser projects and reinvest here. Apple is a brilliant example. Yes, I agree that it’s important to stand out at retail and package design is sometimes the only way to do that. Physical items will always need a package and a designer to make it appealing. At our design studio, we create just a few packaging projects per year but during a recent hiring process, we’ve heard from many young designers that package design is something that they want to do more of and we have seen a growing percentage of package design present in portfolios. Print has come inhouse … but we are also seeing package design coming to inhouse design as well. No. I do not agree. I see packaging as being prostituted in order to try to sell more more more! While there are some really good and cool packaging out there, in today’s world the package tends to be less important than the product or service that is being promoted. Packaging today is all over the place as far as look and feel. I have heard many consumers say it is overwhelming. Then they pick the perfect looking package and are disappointed that the product doesn’t meet the packaging’s influence. I don’t agree, at least not with our experience. I guess you need to define package design — are you designing some cheap carton or a beautiful package for a new beauty product? Verso and NewPage are now Verso Corporation, a leading provider of Printing Papers, Specialty Papers, and Pulp. The new Verso is a stronger, more stable supplier for our customers. Our distinguished product line, streamlined supply chain and flexible manufacturing capabilities make us ultra-responsive to market demand, extending our ability to get you the products you need, when you need them. Verso offers the best quality printing papers with a broad selection of certified and recycled options for all types of printing applications. Our paper mills are strategically located near top industry printers across North America so that our products are available when you need them. We provide expert customer support, on-press technical service and insightful solutions that bring added efficiency and productivity straight to your business. Our distinguished family of sheetfed grades offers you the best in premium through economy grades available for applications including high end brochures, annual reports, corporate collateral, yearbooks, direct mail and general commercial printing. Recently Verso made it easier for coated web paper customers to do business with the introduction of our new web grade offering. And as the digital print market continues to expand, Verso offers a broad range of digital coated products. To learn more about all that digital has to offer check out our latest printed brochure Ed #16 Digital Possibilities. The best digital print quality is now virtually indistinguishable from high-end offset. Equipment productivity and speed continues to improve overall economics. With new print techniques like metallic inks, varnishes, embossed-like dimensionality, ultraviolet ink and more, digital printing is winning over even the biggest skeptics. And with the convergence of data, GPS and other technologies, the realm of possibility has exploded for targeted, highly personalized print strategies — when it comes to reaching and motivating an audience, print works. And when smart technologies meet smart marketers and designers, print works even better than ever. To learn more visit versoco.com or contact your local Verso sales professional.